Heavy cables installed in long vertical raceways impose excessive strain on electrical terminations, and can often lead to disconnections with the potential for equipment damage, injuries and power outages. For that reason, the National Electric Code (NEC) calls out specific installation methods for long vertical runs in NEC 300.19 that require cable supports at the top of a raceway and often with intermediate supports installed at specified intervals. 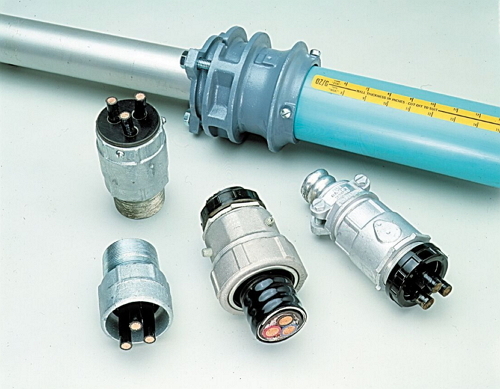 To help electricians ensure safe connections and meet NEC requirements, Emerson offers O-Z/Gedney Cable Supports for threaded rigid conduit, IMC, EMT and wire armored cable with proven field performance to make the difference between being connected and disconnected. Emerson O-Z/Gedney® cable supports utilize the exclusive pOZi-grip Wedging Plug, a unique manufacturing technique that coats the cable grooves with a specially formulated course grain grit to significantly improve holding power in excess of code requirements without damaging the cable's jacket or insulation. Installation is remarkably simple: Thread the cable support body onto the opening of the conduit in which non-armored cables pass through. Insert the one piece or multiple piece wedge plug into the threaded body. The wedge exerts uniform pressure around each cable, providing holding force without deforming the cable insulation. Emerson O-Z/Gedney® cable supports are offered in one- and multi-piece models to meet different application needs including retrofits. One-piece wedge plugs are recommended for non-armored cables 600 volts or less. The multi-piece support is for all voltages and constructed so that each cable is supported between grooves in multiple adjacent segments, providing the uniform pressure distribution required by softer types of insulations used at higher voltages.